Biofuels refer to a new type of fuels derived from plants, including bioethanol obtained through fermentation of corns and biodiesel made through reforming of such oil as waste vegetable oil or palm oil. These biofuels do not increase the total amount of CO2 in the environment—in other words they are "carbon neutral." They are, therefore, said to help combat global warming. Efforts are taken to spread the use of biofuels so that they will replace fossil fuels such as gasoline and light oil*1). Meanwhile, some drawbacks of biofuels have been pointed out. Some biofuels do not meet quality standards for transportation vehicles represented by automobiles, and others cause corrosion of metal and swelling of rubber and resin*2). We are working on evaluation of quality of biofuels specified in Japanese Industrial Standards (JIS) and corrosiveness and the characteristics of exhaust gas with the actual operating environment in view. 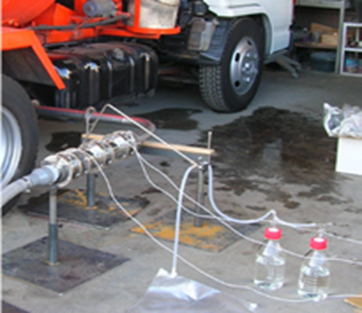 This article reports results of evaluating the practical performance of biofuels including corrosiveness.his article reports results of evaluating the practical performance of biofuels including corrosiveness. *2) Shiro Saka (2006). Baio diesel no subete (All about biodiesel). p. 183. Industrial Publishing & Consulting, Inc. * Called bio diesel fuel (BDF) generally. BDF is a registered trademark. Items in quality standard specifications (JIS K 2390) for biofuels are listed in Table 1. Specifically, these standard specifications are for fatty acid methyl ester* (FAME) that may be mixed with light oil up to 5 mass%. Standards for FAME have been specified with its impact on deterioration of automobile parts and the characteristics of exhaust gas taken into consideration. It is known that FAMEs that do not meet these specifications cause defects listed in Table 2*2). In other words, light oil consists only of saturated aliphatic hydrocarbons and thus less reactive, while FAME is generally methyl ester of fatty acids. Therefore, they are more reactive than light oil, as they generate acids through oxidation or ester hydrolysis, and are unstable in terms of quality. Another feature of FAMEs is that their quality is not always secured. If they are manufactured or purified in an inappropriate manner, they are contaminated with impurity such as water, methanol, or an alkali or have residue of high-viscosity glycerols that affect the performance of fuel. As described above, FAMEs undergo changes in quality, depending on raw materials and manufacturing processes, and may cause various defects. Therefore, maintaining quality of FAMEs requires careful attention. 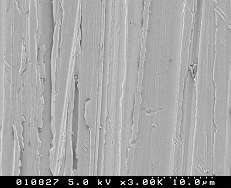 The following sections report analyses of defects caused by FAME, specifically results of investigating how quality of FAME affects corrosiveness of metal and the characteristics of exhaust gas. To investigate the relationship between quality of FAME and corrosiveness of metal under accelerated conditions, we performed immersion tests using a FAME, whose composition is described in Table 3 and which was not diluted with light oil. The FAME had been manufactured from used cooking oil and satisfied all specifications. To examine corrosiveness, plates (20 mm x 20 mm) of carbon steel (SS400), stainless steel (SUS304), aluminum alloy (A6061), and pure copper were used. 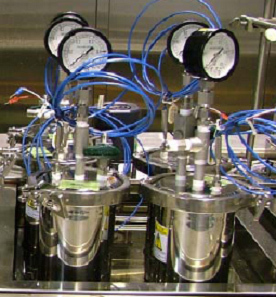 These specimens and 600 mL of the FAME were put into a glass, airtight vessel (Figure 1) and underwent an immersion test at 80°C and normal pressure in an air atmosphere. Comparison of the appearance of the specimens on Day 10 found no difference from their appearance before the test, as shown in images listed in the row named “FAME only” in Photo 1. This result suggests that a FAME that meets to the quality standard specifications does not cause any visual change in the specimens. Then, water and oleic acid (C17H33COOH), which are both representatives of corrosive substances contained in FAME, were added at 0.5 wt% each to the FAME, and another immersion test was performed in the same way described above. Oleic acid is a representative fatty acid that makes up FAME molecules. It contaminates FAME, if it is not perfectly eliminated in the purification process of FAME or if purified FAME is decomposed. The standard for addition of water is 0.005 wt% or less, and that for oleic acid is that acid value does not exceed 0.5 mgKOH/g, which is equivalent to 0.25 wt% of oleic acid. To accelerate the tests, we used larger amounts of water and oleic acid. *2) Shiro Saka (2006). Baio diesel no subete (All about biodiesel). p. 183. Industrial Publishing & Consulting, Inc.* Called bio diesel fuel (BDF) generally. BDF is a registered trademark. As shown in Photo 1, when only oleic acid was added to the FAME, the specimens were slightly tarnished. Meanwhile, the pure copper and carbon steel plates were considerably tarnished by addition of water. When both oleic acid and water were added, they were further tarnished, and the FAME was discolored too. 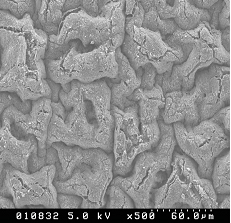 SEM analysis of the carbon steel and pure copper plates after the test found that they were remarkably corroded as shown in Photo 2. 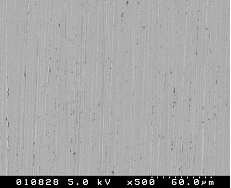 Photo 2 shows SEM images of the specimen and test solution after the test. As to the solution of FAME with water and oleic acid, the carbon steel plate slightly increased in weight, while the pure copper place decreased. In the solutions in which each of the two specimens was immersed, the concentration of ester (FAME) reduced. In the solution in which the pure copper plate was immersed, the concentration of methyl linoleate, which is most likely to be oxidized among the components of FAME, reduced remarkably, compared to the solution for the carbon steel plate. In addition, FTIR and X-ray diffraction analyses found the presence of cuprous oxide (Cu2O) in the solution for the pure copper plate, α-iron oxyhydroxide in the solution for the carbon steel plate, and carboxylate in both solutions. The result of the pure copper plate, which was considerably corroded, suggests corrosion proceeded as follows. Copper is corroded in the presence of water as shown by the following reaction formulas. The amount of added water to the FAME was 0.5 wt%, and therefore, the amount of Cu2+ dissolved in the solution of FAME to which only water seemed to be small. FAME has ester bonds and is thus hydrolytic. Ester hydrolysis is accelerated by acid. In our test, therefore, ester hydrolysis might be accelerated by such acid as oleic acid that is generated from FAME itself4). The generated acid may dissociate in the presence of water as follows. It is likely that water was oxidized by this dissociation, increasing dissolution of Cu2+. It is also likely that oleic acid ion and Cu2+ form salt, which was confirmed by IR and XRD. This salt seems to be insoluble to water and, thus, emitted out of the water system. Therefore, dissolution Cu of might be further accelerated. Analysis of the solution in which the pure copper plate was immersed found that the concentration of methyl linoleate reduced. Therefore, it is likely that oxidation and depletion of FAME were accelerated5). As described above, decomposition of FAME and corrosion of copper proceeded in the presence of water, while carboxylic acid and Cu2+generated in the water system accelerated hydrolysis and oxidation of FAME. Consequently, acceleration of corrosion of copper and depletion of FAME proceed. In addition to the corrosion test at 80°C, which was rather mild temperature, and normal pressure, whose results were reported in the previous section, we at Kobelco Research Institute have successfully performed another corrosion test under the following conditions. 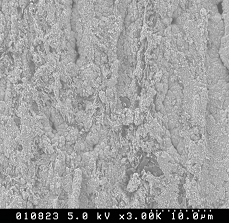 The technique for this test can be applied to investigation of impact on rubber and resin. Instrumental analysis using FTIR and pyrolysis GC-MS and various strength tests provide a wide range of information such as changes in weight and dimensions. We have worked on odor that is emitted by Diesel vehicles, which use a mix of FAME and light oil, reportedly emit odor that is not derived from light oil. In some cases, such hazardous substances as lower organic acids (such as formic acid) and aldehydes (such as formaldehyde) are detected6). As to these drawbacks of new biofuels, we have worked on the composition of exhaust gas and the performance of catalyst (Photo 3). Provided by Daimaru Techno Co., Ltd. This article described techniques to evaluate quality of biofuels, taking FAME as an example. To develop biofuels, several processes are explored, for example increasing the mixing ratio and seeking plant-origin raw materials for which production of food is not affected. Such development of biofuels may be faced with new quality issues. We hope that our evaluation techniques will contribute to development and widespread use of new biofuels.